How Does The Parent Taught Driver's Ed Work? A driver’s education course is a mandatory course that needs to be taken by those who wish to obtain driving privileges. One would first need to obtain a learners permit. There are certain drivers ed requirements that are needed before you are able to drive a vehicle on the roadways. There are also different ways for you to learn how to drive. You can go to a classroom or you can learn online. The Parent Taught Drivers Ed course online is an an online course that lets the parents be the teacher. This can be done at a time that is convenient for those involved. Why is a Driver’s Education Course Needed? Driving is not just getting behind the wheel of a car and hitting the gas. There’s a lot to learn about the rules of the road and the way your vehicle will handle in different types of situations like weather, traffic, daylight and darkness. If the rules and laws are not learned and followed, people are placed in danger. That is why teen driver education is a must. When you choose the online drivers education course, you have the ability to take the course when it’s the best time for you and your parent or guardian. You don’t have to attend a classroom that is located across town and at times that you are obligated to do something else. You can take the course while on vacation, on the weekends and from any computer that has an internet connection. Choosing this online driver education course also offers you the freedom to choose at what pace you feel comfortable in learning. No longer do you need to keep up with others. If you need to go over things more than once, feel free to do so. No one is going to say “Times up”. This course is made to be less confusing so it makes it easier for you to understand what is required of you. There is a guide that you are able to download that outlines the steps that you will need to take in order to know enough to take the test, pass it, and to move forward in getting your driver’s license. The online learners permit test prep course is made to be fun and you can set the pace that you feel you can achieve optimum understanding. There are graphics and animations to help you learn quicker and retain what you learned. The test has a low price that parents appreciate and its convenience is hard to beat. When you sign up for the parent taught drivers ed classes online, you will also benefit from the free learners permit practice test. With this benefit, the questions that are on the practice test have appeared on the Department of Motor Vehicles permit exam. This means that you will be practicing what you will actually need to know when you take the test for real. When you log in for the first time, you will find that there are eight units for this online drivers ed course. You now have the option to finish an entire one, or part of one, and then log out. When you return to log in again, you will find yourself where you left off. You have the freedom to do as many units as you have time for and log in and out as many times as you need. This is part of what makes this option so easy. If you have a parent or guardian who would be interested in the parent taught driver education course, they have to apply for the packet. Once the application is submitted, they will need to pick a school and register the student. The packet will then be sent out. In about three weeks, the packet will be in your mailbox and then you will be ready to take steps to be on the road to learn how to drive! 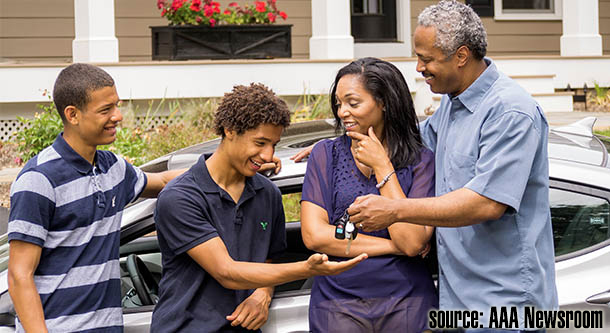 Yes, there are certain things that the parent or guardian needs to adhere to before they are able to teach any teen how to drive. There are several benefits to the PTDE course. One is that the teen would be learning from someone they know and trust. Second, the parent would be involved directly and in making sure that the teen is learning and understanding what they need to in order to pass the tests. Those who take the driver’s education course seriously often become the safer drivers. Parents can best serve at teachers when they serve as good examples. If you run across anything that is puzzling to the student or the parent who is teaching, there is a support staff that is accessible to you 24/7. You can call 800.660.8908 or email. This online driving course is offered to you by Drivers License Direct by Improv. Drivers License Direct by Improv is an easy, affordable, entertaining way to get through the driver’s license process.